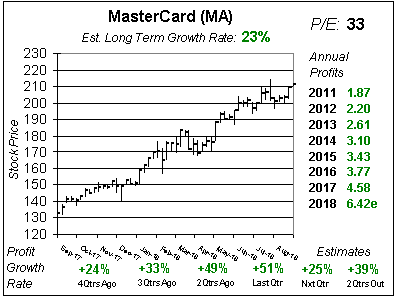 MasterCard (MA) continues to click on all cylinders as profits soared 24% last qtr. This company hasn’t delivered 20% ore more profit growth since 2011. Part fo the reason for that has been a strong U.S. dollar that trimmed profits. But this year, F/X is expected to benefit MA. Sales grew a solid 18% last qtr, which is a great number. MA buys back stock and grows profits faster than sales, so sales growth in the high-teens could mean +20% profit growth going forward. Worldwide gross dollar volume growth was 10%, which was growth 6% in the U.S and 12% Internationally. International card adaptation gives the company growth opportunity, and technological advances with advanced payment types help spur growth. MasterCard’s Cash Passport is a multicurrency prepaid card that lets travelers load up to 7 currencies at a time. Masterpass is an app that sames your credit card info, then let’s you buy things on your computer, iPad or cell phone without typing in your card number or shipping address. You can even wave your phone at checkout terminals to pay. This stock has been a hidden gem for successful mutual funds. Managers know this stock is safe and can deliver mid-teens or better growth profit & stock growth.The company consistently grows revenue each qtr, and that has helped profits increase every year since the stock went public (2006). The Est. LTG is a solid 18% per year in addition to a yield of 1%. Stock buybacks helped profits by $0.04 a share last qtr (MA made $1.34). Overall, MasterCard is a core holding in my Conservative Portfolio, but the stock’s rise has taken a lot of it’s 2018 upside away, thus I’m waiting for a dip to add it to the Growth Portfolio. 24% profit growth last qtr is impressive compared to the growth MA had the previous three qtrs. Profits were expected to climb just 7%, and the company blew away the number. Also, future estimates jumped across the board. 2017’s went from $4.39 to $4.57, 2018’s from $5.10 to $5.40 and 2019’s from $5.89 to $6.31. Qtrly profit Estimates are as follows: 30%, 20%, 21% and 13%. This stock jumped from $110 to $150 in the last year — that’s a gain of around 36% — without a correction. I think it needs to settle down a bit. My Fair Value P/E moves up from 26 to 30 this qtr. That’s a big jump, but maybe not big enough. The stock’s close to its 2018 Fair Value already. And, since MA just blew away the numbers last qtr it could do so again in the future. That would likely raise my Fair Value. 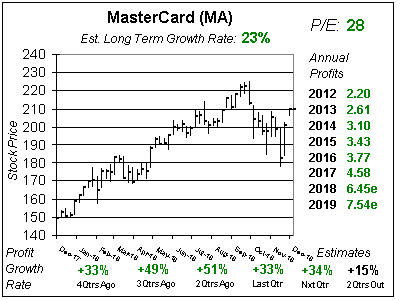 MasterCard has been incredible stock since it went public, and now with profit growth accelerating from 10% to 24% and perhaps 30% ths stock should remain timely for the year ahead. But after the swift rise it made in 2017, I feel growth investors would be better off waiting for a pullback. MA ranks 9th in the Conservative Growth Portfolio Power Rankings. I owned it years ago in the Growth Portfolio and stupidly sold it. I owned Visa too and thought I didn’t need both card companies. That was a mistake, but I don’t want to compound the mistake by buying MA back high, thus I wait patiently for a pullback.